The Metropolis Development stand in the Sewri district of Mumbai; it is situated along the Mahajani path, parallel to Rafi Ahmed Kidwa road. As regards public transportation, the development is connected to the urban network through MRT line 1 (Mumbai CST – Panvel/Andheri) which nearest stop is Sewri, around 600 m far from the complex. The purpose of the study is to carry out a detailed analysis of the parking layout and vertical distribution system. The final objective of the mentioned activities is to provide the Lead Architect and the Client an optimized parking layout, able to decrease the cost of construction and to enhance parking performance through improving levels of service. The study led to the reduction of parking floors and number of elevators provisioned in the initial scheme. Said reduction is achieved following a thorough calculation of travel times for reaching the different parking floors through ramp and elevator systems. In addition, the reconfiguration of one-way ramps on both sides of the building block into a single two-way ramp on one side allowed for the optimization of space utilization where additional parking places are provided on each floor. Access to Levels 1 to 5 is provided only through ramps as a consequential result of the detailed analysis of travel and retrieval times to reach the different floors. 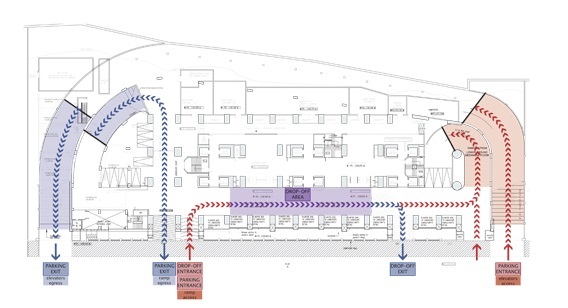 Furthermore, the study validates the length of queue ramps, precisely the ramp connecting the Ground Floor to the Upper Ground Floor, without negative spill backs caused by the same.